Generally observed on the forearms of children as clingy colorful incongruous groups. Yet this is MY silly band. And I am an adult. Most of the time. Furthermore, this is a special silly band. Shaped like Cowboy Woody. The pull-string hero from the Toy Story trilogy. A “gift” from my youngest. Fun loving four year old. JM the rough houser. He got it at Christmas in a 20 pack. Cousins Christmas crazy. Aunts & Uncles laughing. 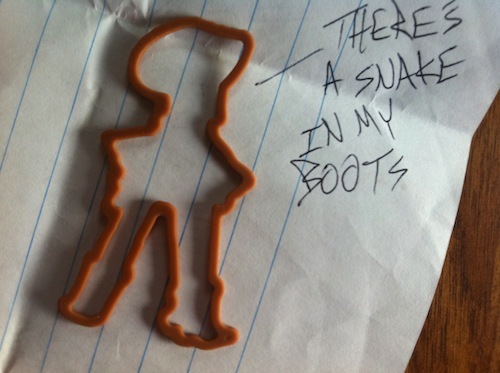 This special silly band fell at my feet as the rough houser ripped into the package. Before we could further debate, my sharp Bride, his sweet Mama, saved me by giving him another present. You’re thinking: You kept it? You wear it? You’re right. I kept it. Wear it every day. You gave your son 20 silly bands & he wouldn't give you just one back. Everything that you call yours is a gift from me. Yet you live in pride as if it's all your own creation. You say you know me, follow me, & trust me, yet you deny me by your actions & attitudes. When I ask for a tithe. A tenth. A tenth of your time, talents, & treasures. Remember the silly band. You love your son. You gave him silly bands. I love you. I give you everything.